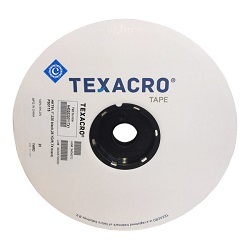 TEXACRO® tape is a high quality product produced by a Velcro Industries B.V., a global manufacturer of hook and loop fastening systems. This new economic hook and loop closure system is manufactured in China utilizing tried and true hook and loop technology and provides a higher quality alternative to other economic options available today. The product range is globally consistent and manufactured in facilities that are ISO 9001, ISO 14001, ISO 13485 & ISO/TS 16949 certified. TEXACRO® Brand Hook T91 is a woven nylon hook, designed for high cycle life when mated with Loop T93, and a wide range of applications. T91 Hook is woven from nylon yarns and is available in widths up to 6 inches wide. TEXACRO® Brand Loop T93 is a woven napped nylon loop designed to mate with hook T91. This loop is also a high cycle life product, when used with hook 91, and is available in widths up to 6 inches. TEXACRO® Brand Hook T91 and Loop T93 can be used in many applications from apparel and footwear to medical and many other industrial uses. TEXACRO® should be considered as an option for applications that require robust closure strength and consistent performance.